Sure, thousands of vacationers head south to Florida each year to get a break from the routine, and Orlando — with its collection of big-name theme parks — is a particularly popular spot among Sunshine State-bound families. But savvy vacationers know that the Grand Strand and the Carolina coast offer several advantages over Orlando, and they go well beyond spending far less time standing around in theme-park lines, spending a lot less money on overpriced attractions and spending substantially less time in the car getting there. 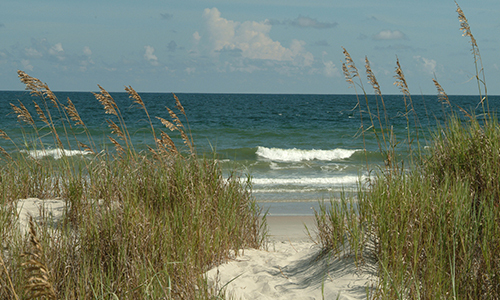 The Beach — With 60 miles of beautiful beaches located right on its eastern edge, the Grand Strand offers easy access to carefree days spent lounging in the soft sands and soaking up sunshine in the cool ocean breezes. While vacationers in Orlando can get to the coast, they’ll have to hop in the car and drive nearly an hour east to dip their toes into the ocean waters. Water Activities — Beyond the beaches and the ocean waters — both of which can, of course, provide plenty of wet and wild fun — the Intracoastal Waterway and a plethora of area lakes, rivers, marshes and man-made water attractions offer an abundance of water activities on the Grand Strand. Water skiing, parasailing, surfing, bodyboarding, slide-riding, paddleboarding, kayaking and more — you name the water-based activity, and it can likely be found on the Grand Strand. Many of these are also available in Orlando, but more often than not, a substantial commute is involved. Fishing — In the Myrtle Beach area, anglers can choose from a wide range of fishing options, such as ocean fishing from the beach or a pier, deep-sea fishing with a charter, fishing the Intracoastal Waterway, and fishing any of the area’s other waterways, including rivers, lakes, marshes and more. And while anglers can fine plenty of ways to wet a line in the Orlando area, the saltwater options require a substantial drive (or superhuman casting skills). Exploring Nature — The Grand Strand offers an array of natural attractions found here and only here, including breathtaking examples such as Myrtle Beach State Park, Brookgreen Gardens, Huntington Beach State Park, the Waccamaw Wildlife Refuge and more. Fresh Seafood — To get the best seafood, you have to go to the coast. And the Grand Strand certainly shines in this area, with fresh-from-the-ocean offerings found at seafood restaurants around nearly every corner. Be sure to check out two especially unique offerings on your next visit to the Myrtle Beach area: 1) Calabash-style seafood, which involves lightly battering and deep frying fresh ocean catches in a delicious (plus crispy and crunchy) way that’s an area signature, and 2) the all-you-can-eat seafood buffet, premier examples of which can be found up and down the Grand Strand. Another area in which the Grand Strand shines: affordable luxury accommodations. And one of the best places around to find a convenient location, wide-ranging amenities and luxurious accommodations is on the Myrtle Beach oceanfront at Bay View Resort. Book your Myrtle Beach getaway today, and come see why Myrtle Beach is one of America’s favorite family vacation destinations!